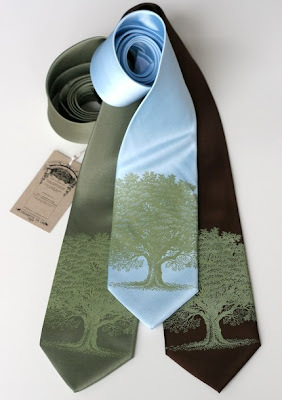 I saw these wonderful ties over at Bridechka and the Wedding, from Etsy seller, Toybreaker, and now I'm coveting. Our colors: sage green and brown. doesn't this just fit perfectly? I think you should show it to him anyway. Maybe he'll surprise you and like it?! Or if not for him then the groomsmen? I have to agree! show them to him anyways... the worst thing he can do is say no. And if he does maybe offer the groomsmen! These are so cute!!! You could always be a diva and say he has to?? Haha, just kidding! Those are awesome, and so unique!